ErgoMates dramatically reduce fatigue and pain experienced when standing or walking on hard surfaces for an extended period of time. By strapping ErgoMates to existing footwear and safety boots, you take mobile anti-fatigue matting with you wherever you go. ErgoMates provide matting to the mobile worker and in the areas where traditional matting systems are ineffective due to machinery or space constraints. The innovative 2-ply sole addresses issues of fatigue, impact shock and slip resistance. Wearing ErgoMates while standing causes muscles to expand and contract as they adjust to the flexibility of the sole. This muscle movement increases blood flow and the oxygen reaching the heart, thus greatly reducing fatigue. The elastic properties of ErgoMates resemble the natural shock absorption of uncompressed soil, similar to walking on grass. Every foot movement with an ErgoMate is absorbed by the give in the soles reducing the effects of impact. The innovative looped matting material on the sole of the ErgoMate contributes to slip resistance in the workplace. Ergomates rarely need cleaning, however, they can be safely washed in any dishwasher or washing machine on a regular basis. Most times you can just tap them together and the debris will fall out. ErgoMates are not a replacement to safety footwear or regular footwear. They have been designed to complement a successful, well-designed ergonomic matting system and to enhance the life of footwear while maintaining all CSA warranties on safety shoes and boots. When you have full confidence that you will be safe, healthy and relatively comfortable at work, you will be happy and more productive. ErgoMates are ideal for anyone standing or walking for extended periods of time on hard or smooth surfaces, any area where anti-fatigue matting already exists, any area where anti-fatigue matting is impractical due to size or moving equipment. Ergo Mates are well suited in factories, assembly lines, machine shops, warehouses, retail outlets, cashiers/clerks, laundry facilities, food service areas, postal workers, couriers, or any situation requiring prolonged standing. 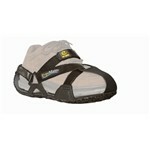 *Mobile anti-fatigue matting you attach to your footwear. *Provides mobility and slip resistance while dramatically reducing pain and fatigue *Reduces impact shock while walking and return energy to the foot while striding *Lessens risk of personal injury, accidents and mistakes *Fully adjustable; straps to almost any type of footwear *Easy to put on and available in five sizesLower cost. ErgoMates, when compared to traditional matting, have a lower total cost per employee per year *100% coverage. All employees can now experience the benefits that only those standing on stationary mats previously enjoyed. *100% mobility. Cover the entire facility with '2 feet' of matting. *100% efficiency. Stand or walk on all of the mat, all of the time. *Increase productivity. Now all employees can experience increased comfort, energy, and vitality resulting in greater productivity and profitability. *Improve slip resistance. Compared to both regular and slip resistant footwear. *Extend life of footwear. Absorbs impact shock on heels and soles. *Reduce trip hazards. No edges to trip on when walking on and off a mat. *Decrease cleaning & maintenance costs. Think of all the time and effort spent cleaning and maintaining traditional mats. *Less waste material. Up to 90% less material sent to landfill when replaced.